More data continues to confirm the value of skin-to-skin care (SSC) as the authors of a freely available study in the May 2014 Journal of Perinatology concluded that “early SSC needs to be aggressively promoted in term and late-preterm newborns to reduce incidence of hypothermia” (Nimbalkar et al 2014: 364). “Mothers were provided clothing in the form of front open gowns with short sleeves and were advised to start SSC at 30 min to 1 h after delivery and continue for as long as possible in the first 24 h with each session lasting for minimum 60 min. SSC was discontinued after 24 h. In the control group, after providing routine care under radiant warmer, newborns were kept clothed (including head cap) and covered with blanket with their mother (bedding in) for first 48 h. In both the groups newborns were exclusively breast fed.” (Nimbalkar et al 2014: 365). “As a routine policy, before 20 min of expected time of delivery, open care servo-controlled radiant warmer is switched on to full heater output on manual mode and blankets are kept under it to make them warm and temperature of delivery room newborn care corner is maintained above 25 °C. All the newborns delivered at delivery room are immediately taken under the radiant warmer, dried immediately and then wet blankets are removed and covered with fresh warm blankets. This policy is different from the WHO recommendations of keeping the newborn on mother’s bare chest immediately after birth. Before transporting newborns to maternity ward with their mothers, they are clothed and cap is applied. Maternity wards are not climate controlled like the delivery room. Temperature of maternity ward was recorded with room temperature monitor at 12 h interval in the noon and midnight when the temperature differences are highest.” (Nimbalkar et al 2014: 365). These findings were published around the same time as those from an appraisal of hypoglycaemia guidelines from postnatal wards in tertiary centres in Australia and New Zealand which aimed to establish how well those guidelines facilitated breastfeeding and adhered to UNICEF UK BFI recommendations (Sundercombe et al 2014). The results of this appraisal showed that most of the guidelines scored poorly and that the promotion of early skin-to-skin contact within such guidelines was one of the areas that could be improved. Nimbalkar SM, Patel VK, Patel DV et al (2014). Effect of early skin-to-skin contact following normal delivery on incidence of hypothermia in neonates more than 1800 g: randomized control trial. Journal of Perinatology 34(5): 364-368. Objective: To investigate the impact of early skin-to-skin contact (SSC) provided for first 24h on incidence of hypothermia in stable newborns weighing 1800g or more during first 48h of life. Study Design: Stable newborns (term and late preterm: Mean gestational age 37.7 (1.35) weeks, range 34–40 weeks) having birth weight 1800 g or more (Mean weight 2605.6 (419.8) grams) were enrolled after approval from Institutional Human Research Ethics Committee (CTRI/2013/06/003790) and randomized into early SSC (intervention group) and conventional care (control group). 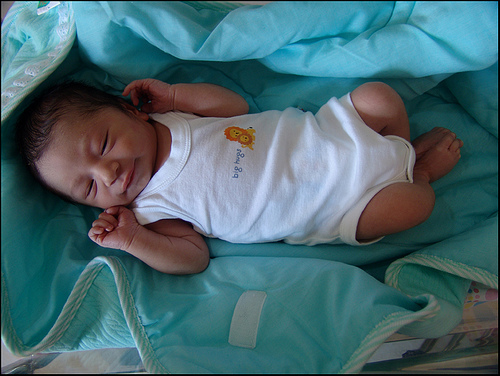 Initial care in the delivery room for few minutes immediately after birth in both the groups was given under radiant warmer. In the intervention group, newborns were provided SSC by their mother started between 30 min and 1 h after birth for first 24 h with minimal interruption and were provided conventional care other than SSC for next 24 h of life. In the control group, newborns were kept with their mother and received conventional care other than SSC for first 48 h. Temperature and heart rate of newborns were recorded at 30 min, 1, 2, 3, 4, 5, 6, 12, 24 and at 48 h of life in both the groups. Independent Samples t-Test and relative risk were used to analyze the data. Result: Both groups had 50 neonates each with similar baseline characteristics. Heart rates were in normal range in both the groups. The intervention group provided an average (s.d.) of 16.98 (0.28) h of SSC over the first 24 h period. The mean temperature was significantly high in the SSC group at all time intervals starting from 1 to 48 h (P<0.05 for all). In the SSC group only two newborns (4%) had mild hypothermia (cold stress), and, of these two newborns, one had two episodes of hypothermia. All these three episodes of hypothermia occurred within first 3 h of life. In the control group 16 newborns (32%) developed hypothermia (temperature<36.5 °C) during first 48 h of life. Of them, 11 newborns had single episode, 4 newborns had two episodes and one newborn had three episodes of hypothermia. Of these 22 hypothermic episodes, 20 occurred in the first 6 h of life and 2 episodes occurred at 48 h of life. Moderate hypothermia was seen in two newborns, whereas rest had mild hypothermia. The relative risk of developing hypothermia in the control group as compared with the SSC group was 8.00 (95% CI 1.94–32.99). There was no seasonal variation in incidence of hypothermia in both the groups. Conclusion: Newborns in the SSC group achieved rapid thermal control as compared with the control group. Early SSC for 24h after birth decreases incidence of hypothermia for initial 48h of life. Early SSC needs to be aggressively promoted in term and late-preterm newborns to reduce incidence of hypothermia. Do neonatal hypoglycaemia guidelines in Australia and New Zealand facilitate breast feeding? OBJECTIVE: to establish how well postnatal ward neonatal hypoglycaemia guidelines facilitate breast feeding and adhere to UNICEF UK Baby Friendly Initiative (BFI) recommendations, and to compare compliance with different recommendations. DESIGN: an appraisal of guidelines obtained via email survey using a UNICEF UK BFI checklist tool. Information about Baby Friendly Health/Hospital Initiative (BFHI) accreditation status was obtained by email questionnaire. SETTING: tertiary neonatal centres in Australia and New Zealand. PARTICIPANTS: 22 guidelines were returned from 23 centres eligible to participate. FINDINGS: guidelines generally scored poorly. On a scale ranging from 31 to 124 of overall guideline quality, the median score was 71. On a scale of 9 to 36 for adherence to recommendations to facilitate breast feeding, the median guideline score was 20. Compliance with the recommendation to promote skin-to-skin contact and early breast feeding was poor across all centres, achieving a score of 59 out of 88. Nine of 22 guidelines mentioned skin-to-skin contact after birth and 14 advised feeding within one hour of birth. The recommendation about discussing artificial milk supplementation with parents received a score of 44 out of 88. Fourteen guidelines listed Large for Gestational Age (LGA) infants to be at risk of hypoglycaemia. Few guidelines included up-to-date references or flowcharts. KEY CONCLUSIONS: guidelines need to recommend early skin-to-skin contact and discussion with parents before artificial milk supplementation. Guidelines suggest LGA neonates are being screened unnecessarily. IMPLICATIONS FOR PRACTICE: guidelines need constant revision as evidence for best practice expands. The UNICEF UK BFI checklist provides a readily available quality improvement tool. ← Could maternal body slope be key to protecting babies? It seems like if not only skin-to-skin, but even placental transfusion prevents hypothermia (etc, etc).